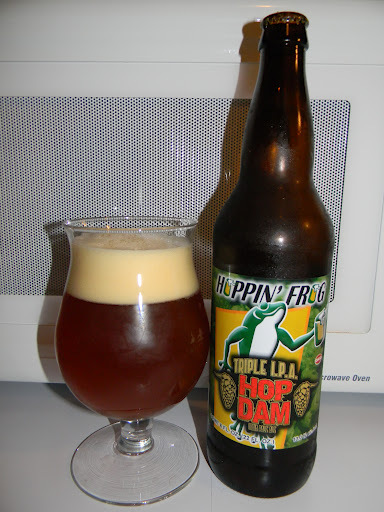 Review of Hoppin’ Frog Hop Dam Triple IPA | Beer Apprentice - Craft Beer News, Reviews, Interviews and Info. For today’s craft beer review I’m going to be sipping on the Hop Dam Triple IPA made by the Hoppin’ Frog Brewery located in Akron, Ohio. Let’s just go ahead and jump to the website, hoppinfrog.com, and find out what this beer is all about. Some say “bigger is better!”. At Hoppin’ Frog, we built a massive hop dam to handle the enormous amount of hops added to this colossal American Triple I.P.A. An intense experience of citrus and piney hop character is complimented by layers of rich malt flavor. Behold our new standard for hoppy beers. This brew stands in at 10.0% ABV and it comes in a 22 oz. bomber bottle. It poured a slightly hazy, deep orange to amber color with an off white head that was of very nice size. It was mostly creamy, soft and fluffy. The retention time was adequate and the lacing was sufficient also. The nose revealed some big piny notes with plenty of citrus available. Tones of pineapple, grapefruit and mango. A very prevalent caramel malt was noticed along with some suitable bready and biscuit hints. It smelled quite floral too. As the brew began to warm the sweet caramel really started to push forward and overtake the overall bouquet. Within the taste I picked up enough caramel malt to satisfy most anyone’s sweet tooth. The bready/biscuit savors were found once again, which added a bit of “roundness” to the taste. The fruity citrus (grapefruit) was there, but it didn’t seem to be quite as forceful as it was in the aroma. Instead some pine resin and grassy hops became more of a dominant factor in the taste. A good bit of bite and bitterness was evident and a subtle taste of alcohol was noticed as the brew opened up a bit. The mouthfeel was medium to full bodied. It was very sticky, chewy, largely smooth, dry and crisp. A small amount of warmth was felt and a good amount of flavor was left behind on the palate after the sip. The carbonation was most agreeable as well. The Hoppin’ Frog Hop Dam Triple IPA was a pretty good and solid beer. Plenty of hops and malt to go around that’s for sure. It is a “big and bold” beer, but I didn’t think that it was the most overly complex or harmonized Triple IPA I’ve ever had. It’s worth a try none the less. I don’t know what it is, but I am somewhat perplexed by the Hoppin’ Frog beers that I’ve had thus far. A lot of people really rave about the brewery, however I have yet to really find a beer that knocks my socks off. I have a Boris and a Silk Porter in my possession that I’ve yet to sample, so I’m hoping that they are the brews that push me over the edge. Do you guys have another suggestion from Hoppin’ Frog that I should pick up? Any advice would be welcome. Thanks for all of the reads and the comments everyone. I’m grateful.